I built my PC half a year ago, and it has worked fine until a few months ago. It crashes, and crashes even more often when I'm playing games. I have a hunch that it's overheating, but I cant figure out how to cool it. There is no dust in the case, I have cleaned it. GPU and CPU heat sinks seem to be working properly, and there is 4 fans inside, all blowing air into the case. The thermal paste has been replaced on GPU and CPU, so I don't think that could be it. I've been running it with the side off and a wall fan blowing into the case for the past few days, it seems to crash less, but still does. I used my phone to record the temperatures while I played a game. This is them before it crashed. They all look pretty high, especially the CPU temperture. That's hot. (and not in a good way.) For a temp to be that hot after all the work and pointing a fan at it, something is bad or it's on the Bunsen burner. Try a different temp monitor prog. Fans...general rule.... in at the bottom.... out at the top. If your overclocking bring it back to stock. I changed than fan set up so the side fan and front fan are pointed in, and the exhaust fans are on the top and back. Temps are still pretty high. I'm not overclocking, and I used the bios temp settings, and it showed it to be around 61 Celsius, I think that's pretty high for it not doing anything but sitting there. The GPU is a XFX Radeon r9 290x, and the power supply is a Corsair CX 750w. The bios temp monitor may not be a good tool to us because of the way the bios code works. Grab another temp monitor prog that runs under windows. Boot the machine to the desktop and compare the readings of your original prog and the new prog. While your sitting at the desktop with no temp monitor progs running open task manager and look at your cpu usage. I checked the temperatures with SpeedFan, it seems pretty consistent with the other program I'm using to check the temps (HWMonitor). The CPU is usually around 60 Celsius, which is my main concern. It rose to around 70 Celsius when gaming, and I stopped before it got to 80. I checked the task manager earlier thinking maybe a virus is increasing my memory usage, but everything seems fine. 60 seems high to start with. But this is an 125W CPU so it may be hard to keep the temps down unless you can try limiting core speed and use. Here's something I try to eek out more time on failing hardware. Drop the CORE count in half. Remember games don't usually see any effect when I do that. While sitting at the desktop with nothing else opened or running what is the cpu usage? I've lost count of PCs churning away doing whatever the malware is asking. Here's a link to Grif's list if they care to dive into that area. In reply to: Good question. Worth doing. Sorry, for the lack of updates, I've been busy. CPU usage didn't stick out to me, but I went ahead with scanning my PC for malware. There was a PUP virus on my PC, I removed it. My pc seems to be running better, it doesn't crash as often but still does sometimes. One of my friends suggested I cut the blue wire on my CPU cooler to have the fan spin as fast as possible, although I want to save this as a last resort. Could it be that my CPU is permanently damaged, and that's why it still crashes? 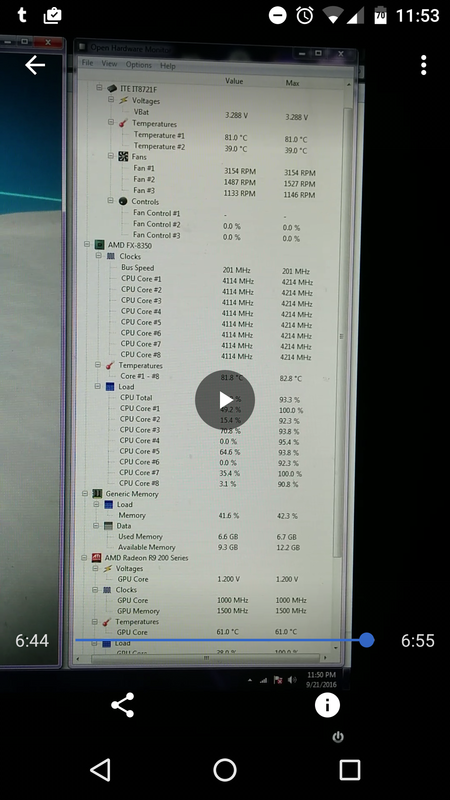 If that cpu is running at 12% while sitting at the desktop you've got a bunch of stuff running. Find that stuff and stop it. Did you run all the the scans at the link mentioned above and in the proper order? This machine shows zero cpu usage while at the desktop. The whole idea of air cooling is proper airflow. While many installs usually have IN and OUT operation. You state yours is 4-fans blowing in. Somewhere, it has to exhaust the air in order to remove heat build-up just as fast or close to blowing in. Also, "airflow" means that the best routing of air gets through the case with as little "air turbulence" as possible and not linger as well, thus promoting good airflow. Also, you state you have re-pasted the CPU, etc., just be sure it's properly done. I suggest you look at vendors video or support website to best apply paste because too much is "bad" and clean before application, too. One of my computers had the same problem, and nothing I did had any effect. I got a new CPU, but it was defective. So, I put the old one back. Something about pulling the CPU from the socket, cleaning the paste off (again), and re-seating it (and the fan), corrected the problem. Temperatures are back to normal. Not sure if it was re-seating the CPU, or BIOS changing to the other CPU and back to the old one. Removing and re-seating the CPU is something you can try.